I love chowder and have tasted some of the best on both coasts. This chowder is built on the same potatoes and cream foundation but takes a turn towards fresh flavors with a nice south-western spicy heat. I believe it is what all chowders would taste like if Arizona, New Mexico and western Texas had ocean front property. We loved the flavors of this chowder so much we went home and made this RV friendly version. I think you'll like it. 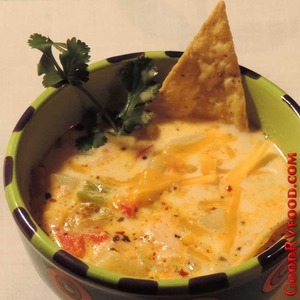 We first tasted this chowder at a New Mexican restaurant in the tiny mountain town of Ouray, Colorado. Ouray is an eclectic place where beignets and Poboys, amazing steaks, fine Italian, a beer garden, Mexican and other wonderful foodie treats can all be experienced while viewing close-up mountains that look like they jumped right out of an Alpine postcard. If using raw chicken, cube and sauté the chicken pieces in a small amount of oil until done then remove from the pan and set aside. Add a little water to de-glaze the pan then sauté the onion and bell pepper until just translucent. Add the potatoes, green chile, bouillon, spices and enough water to just barely cover the potatoes. Cover and simmer until the potatoes are almost done, about 10 minutes. Remove the lid turn up the heat to let the liquid reduce and thicken a little. It will look like thick gravy at this point. Add milk, corn and chicken. Cook just until everything is hot and the corn is cooked but not soft. Serve with grated cheddar cheese on top of each bowl. A few corn chips added at the table are also a nice touch. Using cream instead of milk makes a richer chowder. All amounts are approximate and can be freely substituted. Use what you think looks good. 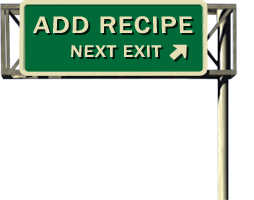 You may substitute a Mexican spice blend for the individual spices to save room in the pantry.